Do you know where to go for care? Deciding where to go to see a doctor can be confusing. From urgent care to the emergency room to a primary care clinic, there are many places you can go to get the medical care you need. What is the best option for you? If you are experiencing a life-threatening emergency, call 911 or go to the nearest emergency room (ER) for care. Visits to the ER should be only for life-threatening or very serious emergencies, such as broken bones, chest pain, severe stomach pain or head injuries (see the adjacent list of several possible life-threatening symptoms). If you are not experiencing an emergency, think of your options before going to the ER. Many non-emergency issues can be cared for by a primary care provider, like a sore throat or medication refills. Going to the ER for common minor illnesses and injuries can make it more difficult for patients who are having an emergency to get the care they need. Visiting the ER can also be expensive and mean long wait times to see a provider. Another reason many people find themselves in the ER is because they have not had regular care for their ongoing health conditions and are very sick. Many health issues, such as diabetes, heart disease and asthma, can become life-threatening if they are not managed with the help of a primary care team. If you are not experiencing an emergency, your best option is to make an appointment to see a primary care provider. Primary care clinics can treat a wide variety of health issues, from ongoing health conditions to common illnesses and injuries to preventive care to keep you healthy. At primary care centers, a team of doctors, nurses, nutritionists, social workers and more work with patients to help them manage ongoing conditions before they become life-threatening, and help improve patients’ overall health and well-being. It is important for anyone living with an ongoing health issue, such as diabetes, asthma or high blood pressure, to set up care with a primary care provider and see that provider regularly. 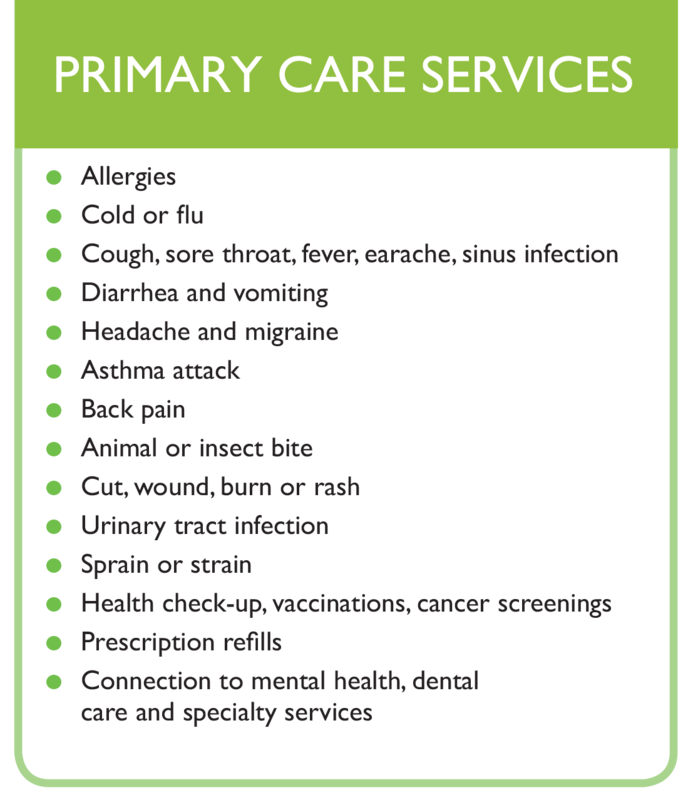 People can also visit a primary care health center for many common illnesses and injuries, like allergies, headaches, fevers, sinus infections, sprains, wound care and more (see the adjacent list of example primary care services). Primary care services can also help you stay healthy and prevent issues with services such as vaccinations, prescription refills, cancer screenings, and adult and well-child check-ups. A primary care health center can also connect you to other services you may need, such as dental care, behavioral health and specialty services. If you do not have a primary care provider, see these health services resources from Public Health—Seattle King County. If you visit an urgent care center, be sure to update your primary care team to help keep your health records accurate.